It almost feels wrong to post this. I mean, there's a tradition to maintain on this blog. It is this recipe that marks the beginning of cooler temperatures and sleeping with the windows open. I post it every.year. But this week was Dan's birthday, and in his usual style, we needed a birthday cake that didn't fall in the super-sweet or super-chocolately category. He's more of a cheesecake, apple crisp or shortbread kind of man. That's when I remembered this recipe. Clipped from a farming newspaper way back when we lived in Illinois. I wasn't even sure I still had the recipe--that little slip of newsprint, fragile and folded, tucked away somewhere. But on his birthday afternoon, when I opened my old recipe box, to see if I could dig it out among the other recipe artifacts, there it was. The very first recipe in the box. Waiting for me. The cake isn't super-sweet and bakes up like a sheet cake. And the cheesecake frosting? Well, it's the frosting on the cake, of course. Try this. It won't disappoint, and then be sure to break out that pumpkin bread recipe some time, too. It's tradition. 2 cups sifted powdered sugar. In a mixing bowl combine the eggs, sugar, oil and pumpkin until light and fluffy. ( FYI: I did all mixing by hand, to save breaking out the major appliances.) Sift together the dry ingredients (if you want to be an over-achiever) and add to the wet ingredients. Mix thoroughly. Spread batter into an ungreased 15 x 10 x1 inch cookie sheet (aka jelly roll pan). I lined mine with parchment. (I am an over-achiever.) Bake at 350 ° for 25-30 minutes. Cool and frost with cream cheese frosting. I just wanted to let you know that your pumpkin bread is hands down the best pumpkin bread I have ever had. And the recipe is fail proof- it turns out perfect every time!! 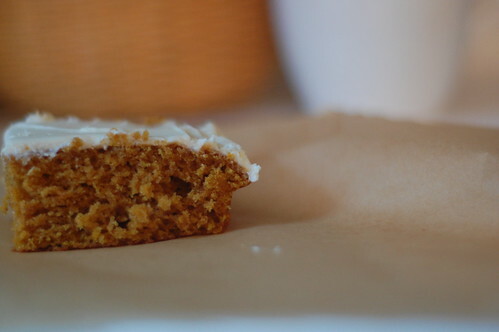 Although these pumpkin bars do look pretty scrumptious!! I am definitely going to make it! I am pretty certain that what theys ay about rules, applies also to traditions. 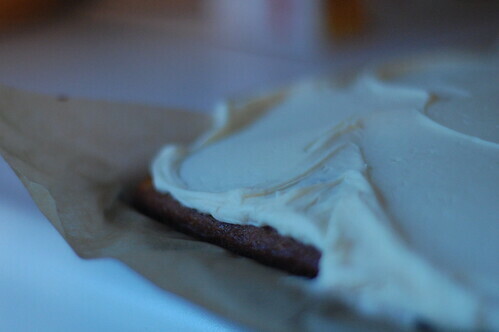 especially if said breakage includes cream cheese frosting. i think we need some of these, no matter that all the birthdays are behind us. Definitely making this to welcome in the fall. And then I'll make the pumpkin bread, too! Um, yum! Pinning this and making it tonight :). Yes! Hello you dear thing, I have never commented on a blog before and in fact just discovered blogs recently but I want you to know that I treasure yours. I have just spiraled back through a couple of years of your blog this evening, and it has been a lovely journey, and I have laughed, cried and commiserated like the sentimental fool I am, and thank you, and thank you. 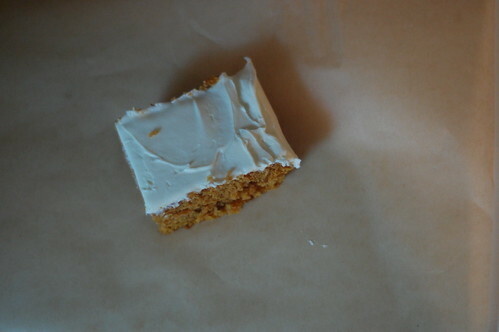 This is kind of a melodramatic response to your pumpkin cake, (which I'm sure is delicious!) but that's how I roll, and I'm up here in Massachusetts on my porch and here we are in 2011 but I still think the internet is kind of bizarre but you're marvelous and you inspire me and I know this is a run-on sentence but. Keep it coming! And my name is Molly too. I've already broken out the pumpkin bread recipe, and shared it with a group of girlfriends with whom I did a get-away weekend and with my co-workers. They think I'm a genius baker (I'm so not) because of your pumpkin bread recipe. But I'm willing to continue to illusion by trying this as well. thanks! This looks really good! Thanks for sharing I am going to try this!